Preserve the memory of your special occasion or loved ones on this beautiful, national mountain shrine devoted to Our Mother Mary. By honoring or memorializing your loved one on these holy grounds, your memories become in communion with this special place. 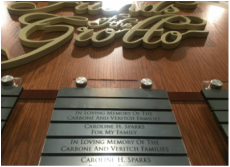 1.5" x 4" name plates on the Friends of the Grotto memorial wall located in the Miller Family Visitors Center. 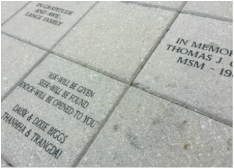 12"x 12" concrete pavers draw you into the entrance of the Corpus Christi Lane that takes you along the copper Stations of the Cross. 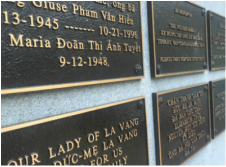 9" x 6" bronze plaques located in St. John Paul II shrine, Our Lady of La Vang shrine and on the walkway to St. Mary's Chapel. We will assist you with your memorial and provide a proof for your review before installation.